I have been in Potsdam for a little over a week, and I am loving it!! 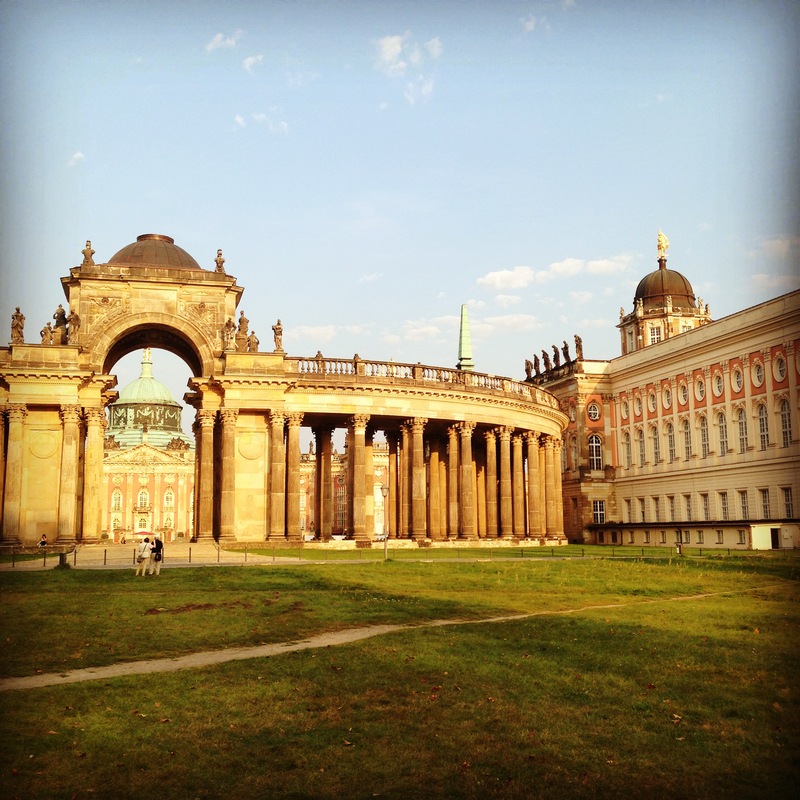 The palaces in Potsdam are all amazing (I suggest you all google Potsdam, Germany palaces). The day I arrived in Berlin, Laura, my buddy – like an Ole Miss Global Ambassador – met me at the airport and helped me get all of my stuff to Potsdam. I stayed in a hotel the first night, since I couldn’t pick up my keys until the next morning. The hotel was in the very heart of the city – Hotel am Luisenplatz. I didn’t mean to, but I fell asleep at 3:00 pm… whoops. But I managed to not be jet lagged the next morning somehow? As I was getting ready for a long Monday, I opened the curtains to look down Brandenburger Straße. The sun was shining on the original Brandenburger Tor, the other more famous one is in Berlin, and bakeries were opening all down the street. I knew I had chosen a great hotel to stay in for my first night here when I saw that. I got to eat my complimentary breakfast outside. A great beginning to my stay here! Later in the morning, Laura and I went to pick up my keys and get a German SIM card. I now have 3G and can SMS other phones in Germany, which is vital! My number is so strange though! I can’t type it out because I still don’t know it by memory. My room is very close to campus, but I can definitely say I am getting what I am paying for. 190 Euros per month is about 250 American dollars. How great is that?? But it’s a single room furnished, with a bathroom and small refrigerator. The kitchen is shared with the rest of the floor. It’s not bad for a few months, but maybe I will move closer to Berlin next semester when I have my Student ID (it allows free travel in Potsdam, Berlin, and the state of Brandenburg). I also bought a bicycle today!! Almost everyone here has a bike, and it’s so convenient. The place I bought it from, Rocco, is fixing it up since it is used, and I am getting it on Saturday! Most of my time in Potsdam has been spent in my introduction course. It is for international students studying in Potsdam, so I have met people from several different nations. I think there are actually only two American individuals in the course, one being me and the other a boy from New York. I have already made friends, too, which is great for me since I can be shy around new people! We are going on a tour of Berlin tomorrow. My friend, Martina, showed me around a couple of summers ago, but hopefully I will pay enough attention to be able to get around Berlin myself after tomorrow. The weather here is so much nicer than in Mississippi. Humidity basically doesn’t exist. Amazing, right? The days are a little warm when you are in the sun, but there is usually a nice breeze. Between classes, my friends and I go sit in the grass in front of the Neue Palais. It’s great to sit in the sun after an hour and a half of being in a classroom. We actually already have a regular spot that we have claimed, sort of like Blair and Serena on the Met steps! Getting used to living in Potsdam and Germany will take some time, but I am on my way there! This is the view from our sitting place. Jealous? ?